Pros: Fun to play (even casually), high replay value, decent graphics. Cons: Sound isn't so great. 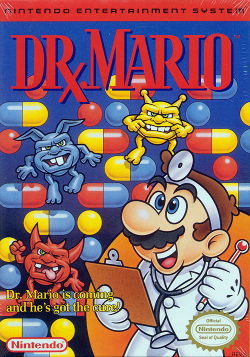 Dr. Mario is a classic puzzle game developed by Nintendo for the Nintendo Entertainment System (NES) console in 1990. It has since been ported to a multitude of other Nintendo consoles and hand-held devices, where it continues to do quite well. Mario apparently moonlights as a doctor when he's not snaking drains or fighting Bowser, and that's pretty much all there is to the game's premise. The main screen of the game takes the form of a clear pill bottle, and the gameplay takes place inside this bottle. Inside you will find the play area which contains little viruses that can be either red, blue or yellow. Though there are no grid lines, you become immediately aware that the area is on a grid, and each virus takes up one block. Mario stands on the side of the screen holding different pills that are made of two different halves, each of which is either red, blue, or yellow as well. He tosses them into the pill bottle one at a time, and it's up to you to position the pill so that it lands on a virus. Now the puzzle portion of the game stems from the fact that you can only destroy a virus and eliminate it from the play area by forming a horizontal or vertical line with the virus and three pill capsule halves. After you clear the play area, you continue on to the next level, and since each level contains more viruses and the pill capsules drop faster it can get pretty intense and challenging. This game is very similar to Tetris in that regard, as even though the two games are vastly different the overriding gameplay is still the same: manipulate the pieces to form lines and progress. There is an "ending" after you finish level 20, where you get to view a short cut scene, but after it's over the game continues on indefinitely, until eventually there are so many viruses stacked up that it's impossible to proceed. The graphics look pretty nice for a NES game, really polished and colorful. Still, it's a simple game that mostly consists of simple sprites on a single screen, so the bar is set pretty low to begin with. Audio wasn't as good, having only a couple of non-intrusive sound effects here and there and sadly only two background music tracks to chose from. The sprite of Dr. Mario himself (tossing the pills into the bottle) is actually fairly convincing and pretty detailed, and in addition to that you also get sprites for each of the three colored viruses. They appear on the left side of the screen under a magnifying glass sprite to laugh at you and make faces at you as long as there are any viruses left of the matching color in the play area. When you clear the last blue virus for example, the blue sprite guy will fall over and then disappear. It's nothing special, but it's still a nice touch to add to a game that could have otherwise been very bland. There is also a 2 player mode for Dr. Mario, which has one player on each side of the screen playing head-to-head. Completing lines to clear viruses will cause random pill capsule halves to drop randomly onto the other player's play area, complicating their game greatly, but is otherwise the same as the single player mode. I actually enjoy playing the 2 player mode, and have logged countless hours playing against my cousin when I was younger. Controls are obviously simple but are quite responsive, making this an easy game to get into. These days Dr. Mario can be found online for about $3, which is nothing. It's a really fun game, even more so playing against a friend, and it costs very little; there's really no reason this shouldn't be in your collection. Dr. Mario is an easy recommendation for NES game collectors, fans of casual puzzle games, and especially fans of Tetris.